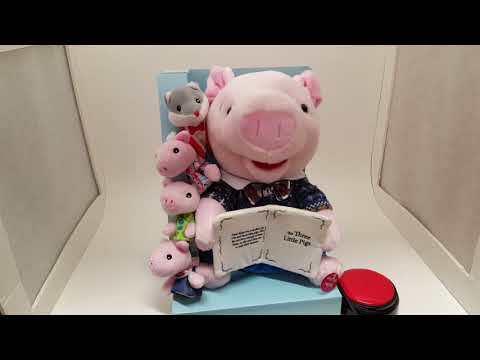 Preston the Pig has been switch adapted to accept a standard 1/8" switch so kids with disabilities can make Preston play. Preston's mouth moves and his body sways while he reads his story. Press your switch (sold separately) or press his hoof to hear him recite the classic story The Three Little Pigs. Press your switch during the story and he stops. He starts over again when the switch is pressed again. Includes oh-so-cute finger puppets of the three little pigs and the wolf. This makes it even more fun for kids to engage in cooperative play. Measures 12.1" x 8.8" x 8.4", requires 2 AA batteries (included).